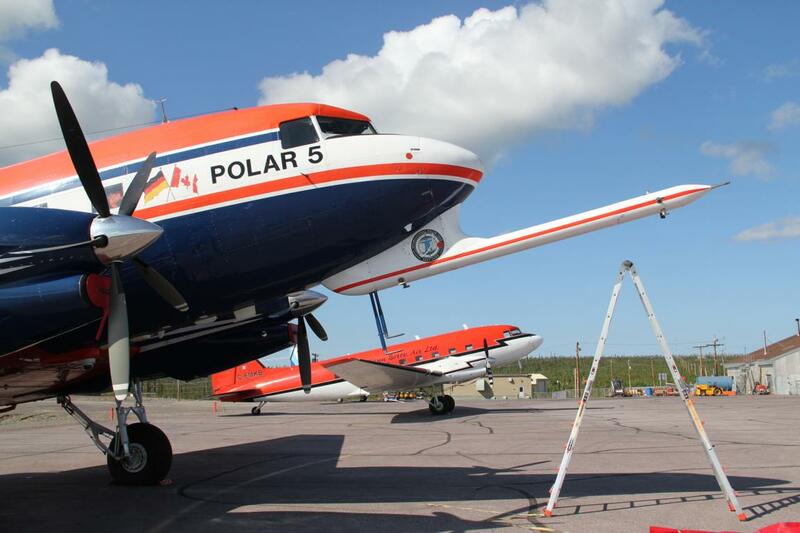 I would like to open our blog with a short summary of this year’s measurement campaign AIRMETH (airborne measurements of methane fluxes), that took place in Alaska and Canada in July. We are looking forward to report live from our expeditions in this blog in the future! 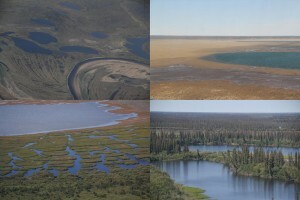 This year AIRMETH took place for the third time, and for the second time in the permafrost areas of northern Alaska and northern Canada. Together with our partners at Alfred-Wegener Institute (AWI) in Bremerhaven we aim at quantifying methane emissions from permafrost regions and analyzing regional differences. As visible on Fig. 1, permafrost soils have different surface structures and coverage. Therefore the landscapes looks very impressive during overflights and on pictures, but are also a very interesting subject for research, as lakes, wetlands, sandy or forested areas emit different amounts of methane into the atmosphere. 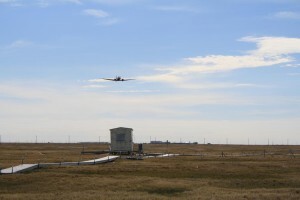 Often these methane fluxes are measured with instruments that are installed on a metal tower. Ideally, these towers are installed in a way that the methane fluxes measured with the attached instruments are coming from only one surface, e.g. forest. In order to cover as many different surfaces as possible, we conduct measurements from an airplane or helicopter. For AIRMETH campaigns we use the Polar 5 research aircraft (Fig. 2) from AWI. 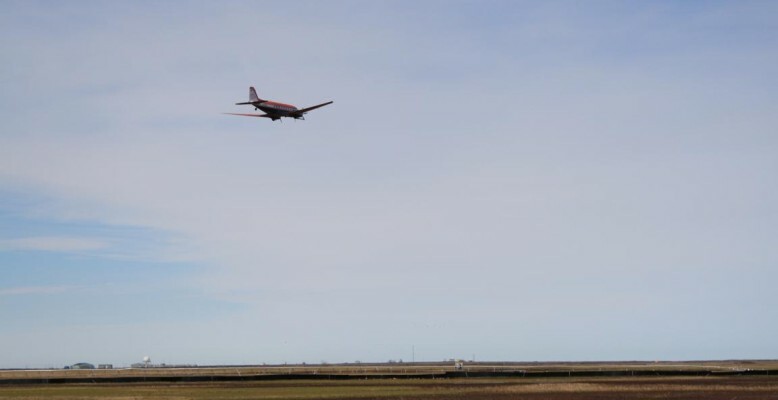 In order to capture methane emissions from the soil to the atmosphere correctly, we have to fly close to the ground. During this year’s AIRMETH campaign “close to the ground” meant between 30 to 50 meters above ground. Of course the safety of the team on board (normally one engineer, two scientists, pilot and co-pilot) has priority! For AIRMETH 2013 we spent four weeks in July in the North American Arctic. For the first half, we were based in Barrow, Alaska, for the second in Inuvik in the Mackenzie River Delta in Canada. During AIRMETH we mainly had excellent flight conditions and could have science flights on 16 days, totaling to 76 science flight hours. Overall, we collected flux data at a length of 10,000 km. Overall, this AIRMETH campaign was the most successful one. 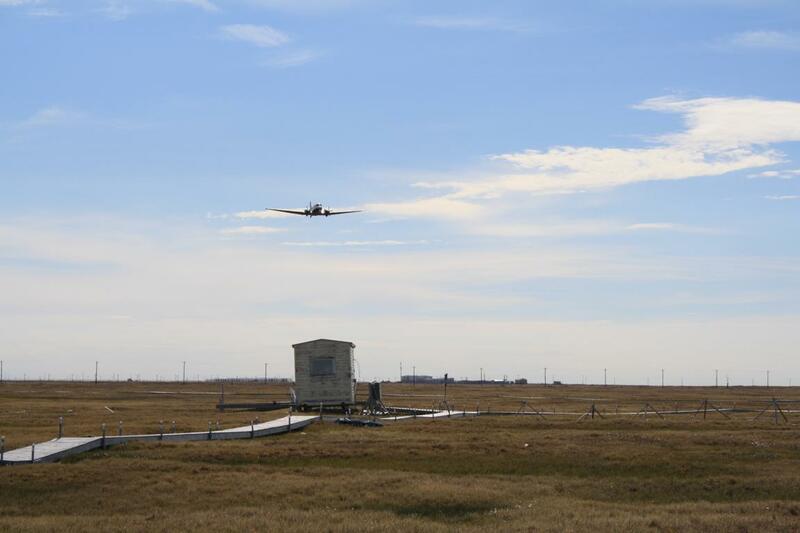 During the AIRMETH campaigns we combine flight legs in low altitudes for flux measurements with legs in several 100 meters above ground. We use these higher sections for operating photo and video cameras as well as a hyperspectral camera. With the hyperspectral camera we obtain highly resolved information about structures and coverage of the land surface. Furthermore, a laser scanner is installed onboard Polar 5 in order to capture topography of the area. The data from hyperspectral camera and laser scanner are very helpful for other groups who are interested in vegetation patterns or coastal erosion. Therefore, we established cooperation with different groups at universities and institutes, like the Helmholtz Young Investigators Group COPER at AWI Potsdam, whom we provide the data. Towards the end of AIRMETH 2013, we were spontaneously visited and interviewed by a Canadian film crew, who was working on a movie about a journey through the Northwest Passage. They stopped at different locations and documented research projects, culture or the nature. Once this movie is shown on TV, you will find the link here in the blog.